Take a tour of this low cost year-round passive solar bioshelter in Massachusetts that has raised beds, aquaculture, hydroponics and worm bed. My wife & I are trying to determine the best (cheapest, easiest, fastest) way to build a well insulated micro shelter for a shelf that is gonna need to be about 4′ wide x 5′ high x 2′ deep… enough space for 14 barrel lids of fodder. It’s for fodder sprouting. We bought this place last year & are trying to get everything going still… we were just approved for keeping the ag exemption that the 5 acres had when we bought it but its way WAY more expensive so far to qualify for the ag exemption so after seeing on YouTube how feeding the chickens and sheep with fodder instead of store feed is 4-8 times cheaper we are trying now to set it up. We have no room inside the RV we’re living in temporarily so its looking like we will use 50 gal. plastic drums & a few straw bales in between with chicken wire & visqueen wrapping. We already have the materials listed so it is what we figure to use temporarily… not many straw bales left but enough to take apart for filling gaps between barrels. Filling up the barrels with water will either be good insulation/thermal mass 2′ diameter (roughly)… or bad insulation compared to straw bales (that is one question)… but if its a good insulation and structural material (high density polyethylene)… why wouldn’t this work for a whole house? A 40′ x 40′ house could be built with these stacked 2 – 3 high (on shelving for safety) for around $200 – $300 per wall… or is this just a bad idea? The barrels will work great for small structures. Things get much trickier when building houses. There are windows, doors, larger spans with greater loads, etc. I suggest starting with storage sheds and other outbuildings, then gradually build larger ones as you improve the techniques. For houses, you’ll probably want to include a post and beam frame. Please document your projects and share with others. Owen, thanks for this post. Very inspiring up here in Cape Breton. Thanks. 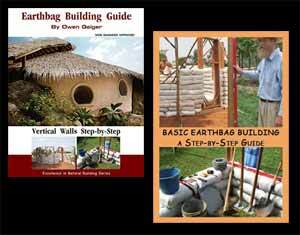 I’ve been interested in bioshelters for a long time. For just a little more than the cost of a greenhouse, you can add compost heating, aquaponics, chickens, earthworms, solar water heating, etc. and greatly extend the growing season and range of usefulness. There’s another video on the Possible.org website (see link above) that shows a larger bioshelter with loft. Someone like me who doesn’t need a lot of space could easily live in a loft that size. That would turn the bioshelter into a … biohome? Ha ha. Oh, wait. It would overheat in the loft. Better to build a tiny house on one end of the bioshelter and then you can easily control how much heat comes into the living space. I haven’t seen anyone build something like this yet — bioshelter plus tiny home. This would make a tiny home much more livable if you could work and wander around inside the greenhouse part. Hey Donald. I just did a Google Image search for Cape Breton. Very nice. What’s it like up there? Is it even colder than Maine? More mosquitoes? Longer winters? A bioshelter would be perfect for cold climates like that. You could add insulated window shades (homemade = low cost) and a wood stove.